On Tuesday, Outback Steakhouse agreed to pay $19 million to settle a sexual discrimination class-action lawsuit. According to the Equal Employment Opportunity Commission (EEOC), which filed the suit on behalf of thousands of female employees, the chain has instituted a "glass ceiling," making it exceedingly difficult for women to ascend to management positions. The lawsuit takes issue with Outback's requirements for employees to reach the level of supervisor. In order to advance to "higher-level, profit-sharing" management positions at Outback, applicants need to have kitchen experience. The EEOC's suit alleges that the chain refused to allow female employees to work in its kitchens, effectively blocking their path to advancement. Women who have worked at corporate-owned Outback restaurants since 2002 and have at least three years of tenure are eligible for part of the $19 million payout, which they can apply for through the EEOC. %%DynaPub-Enhancement class="enhancement contentType-HTML Content fragmentId-1 payloadId-61603 alignment-right size-small"%% In addition to the financial settlement, Outback also signed a four-year consent decree that institutes several structural changes in its promotion process. The restaurant chain has agreed to create an online process that will enable employees to directly apply for managerial positions and it will hire a "Vice President for People" who will assist with human resource problems. 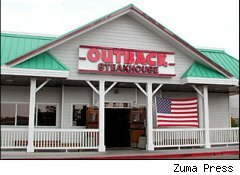 To ensure that Outback is complying with the terms of the agreement, the company has also agreed to bring in an outside consultant for at least two years and will report to the EEOC every six months. "There is no glass ceiling at OSI, and we do not tolerate discrimination in any form," says Liz Smith, CEO of Outback's parent company OSI Partners LLC. Yet, according to the lawsuit and other complaints filed against the company, sexism at the company's restaurants seems to be quite common. In addition to the current case, which covers thousands of complaints at hundreds of restaurants, Outback has been repeatedly cited for its treatment of female workers, at both the server and managerial levels. In 2001, the chain was forced to pay a $2.2 million settlement to one of its female workers who was replaced by a male employee at almost double her salary. When it comes to sexual harassment issues at OSI Partners, the knife seems to cut both ways. According to EEOC lawyer Guy Knoller, Fleming's Prime Steakhouse, another of OSI Partners' restaurants, is facing a sexual harassment lawsuit. In this case, however, it appears that the restaurant tolerated abuse of male employees. As Outback's policy changes demonstrate, changing the company's sexual attitudes and employee treatment may be difficult, but refusing to do so could be devastating.